Hello people! A big shoutout to my new followers and readers! You encourage me! 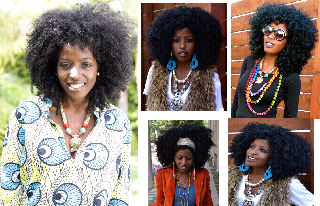 It's not my fault really because this Nigerian natural hair doll has hair and style that's absolutely delicious! I love the fullness, fierceness and fabulosity of her hair and the fact that she has found her signature natural hair style and it's hot! I'm still trying to find a signature look that I'm comfortable with and can hold it's own any time. This style diva is also not afraid of colours! I love the way she mixes up colours and prints in a fun yet sophisticated way. I love her boho chicness! Everything put together makes her an afrocentric femme fatale IMO! Who is this babe I'm gushing about?! 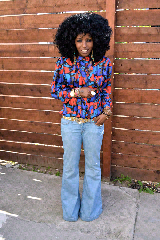 She's none other than Folake Huntoon....the ultimate street style icon! She's the owner of a fashion and style blog,stylepantry.com and a hip organic clothing line called WeWeClothing catering especially to children. She was also a presenter at the 2013 Academy Awards rocking a simple but classy green number by Nigerian designer, Jewel by Lisa (just had to add this because I'm a fan of Lisa's designs!). She's also a yummy mother of three. She's taught me that there's absolutely no excuse to let yourself go just because you are a mummy and wife with a career! 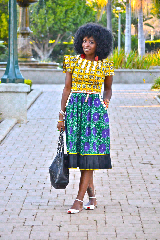 She's 100% Nigerian, grew up in Ibadan and currently resides with her husband Greg in Beverly Hills, California. I don't know how she gets her coils to be so consistent! 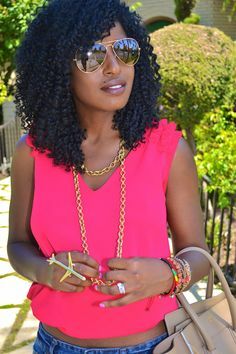 On her blog and in a interview with Nikki of curlynikki.com, she said she had the simplest regimen. Wash with shampoo, condition, apply Dax and style... shikena....nah! There has to be more to that!!! Lol! Here are some pics of Mrs. Huntoon's fabulous hair and style! 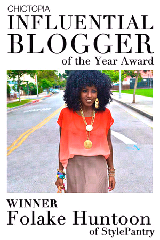 Well join me and stalk her on stylepantry.com where she posts daily pics of her enviable outfits from her endless closet! 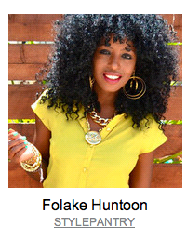 Folake Huntoon's hair is out of this world! Still a newbie and trying out different styles for now before settling on a signature hairstyle. I wouldn't mind consistent coils at all but Naija weather won't agree...haha! Folake's hair is GORGEOUS and it suits her perfectly, it is also a weave. I wish she would just come and be forthright about it, no one is judging her. (Certainly not me) More power to her for rocking the same style weave for all these years! You are a hater. Why do you care? It's her hair...do you know her personally? I don't know why you trolls can't mind your business. It's a popular hair grease like SoulMate and Blue Magic that's petrolatum based. I knew Folake YEARS ago when she lived in the Maryland area. She is definitely faking it. That hair isn't hers. Sheesh! If she paid for it, it's hers! If she grew it, it's hers! However you look at it, it's hers, not yours. Sheesh! I don't believe the question is how it is hers but how does she take care of her own hair, that grows from her scalp, to consistently look the way it has over the years. Curly Nikki website is centered upon "Black" natural hair and its maintenance, styling, tips, products etc. Thus, it is rather misleading for Ms. Huntoon to share that her maintenance of her "hair", if it's been bought & added, is simple ie. Shampoo, use Dax pomade, etc. & "Voila", especially when the hair that is being worn is synthetic or human from another person. and i thought it was all hers, but doesnt really matter as long as she is repping curls well, it doesnt matter if its really hers or not. It's beautiful, regardless. I asked about if she would tell us about her hair on instagram + she flatly blocked + unfriended me. :-/ sad. Still... it's beautiful, whether it's a wig or not. I dont think there's any harm in being honest about it. We're all girls! We can change it up with magic hair + lashes anytime we want! I wish she would just reveal where she gets it from. I could care less if she wears weave or not. I just love the curl pattern and would love to get it.